Parlez-vous français? – Unequivocally Awkward! But EVERY. SINGLE. TIME, I would actually get around to trying to write something funny, it was either not very funny or I had to read about another Black person murdered in cold blood. And I don’t know about you, but while I don’t post every single thought that I have on social media, that mess affects me. DEEPLY. A few nights ago, I went to a Stromae concert (my 2nd since I’ve been in LA and worth every penny). If you don’t know who Stromae is, please get with the program. Anyways…I was at this concert with a bunch of 20something year olds who were columbusing (When white people claim they have invented/discovered something that has been around for years, decades, even centuries.) Stromae’s music. This one girl thought she was cute by talking about how she’d been listening to his music since last June and that people were so late to the bandwagon. I guess at some point, the eye rolls, exasperated sighs and head shakes must have caught the attention of a particular gentleman (not like that). He tapped me on the shoulder to ask me how I found out about the concert. While I could hear his really thick French accent, he addressed me in English, so I responded in English. I told him that years ago I went to visit my uncle in France, heard Stromae’s music and have been hooked ever since. I wish y’all could have seen the look of shock on his face. I wasn’t sure if he was shocked that this (at least to his knowledge) “American” had spent time in France or that it was possible that some people had been exposed to Stromae’s music before last June (gasp! Don’t tell homegirl) And because I sound (for the most part) “American” when I speak English, I wasn’t at all surprised that he smirked and asked me if I learned any French during my time in France. It’s happened more than once. I usually just shake my head and say, “Well, actually I speak French”. And for some reason, people always try to test that statement. Let me ask y’all a question. Is it a thing to say that you speak French, say “Le fromage” and then think you’ve fooled them with your mad language skills? I feel like most people who say they speak a language, usually speak it. So (of course) he asked me to prove it by continuing the conversation in French. Upon learning that I was being truthful about my multilingual abilities, he proceeded to ask me if I was from France, Belgium, Switzerland, Louisiana, Mars, Neptune, The French School on Jupiter (by the way, they are now enrolling but space is limited. That whole super prestigious being in outer space/not fit for human life thing. You understand?) etc…Everything but any of the numerous predominantly Black countries that France colonized. I know some of y’all may be thinking “Oh here she goes making it a race thing.” Nah, I’m not making it a “race thing”. I’m making it a “y’all need to start teaching history in these schools” thing. I could have just rolled my eyes at the ignorance, but these children will never learn unless you let them know. And I know, I know y’all. It’s exhausting having to always teach people but somebody’s gotta do it. Otherwise they reproduce and their children are even dumber. I wish somebody had educated the people I met when I traveled overseas. Common sense would dictate that most countries that speak French have been, at some point in their history, colonized by the French (yes that includes countries such as Belgium and Switzerland as well). My people did not wake up one day and filled with the Holy Spirit started rolling their r’s in the back of their throats and adding letters to words that you don’t actually pronounce. (English-speaking people, how do you think this word [temps] is pronounced? You probably said it wrong because it has 2 extra, unnecessary letters at the end. Oh, and the “em” is actually pronounced like an “en” but not a hard “en” like the word ten. Welcome to French 101). But even more than the lack of common sense, it is terrifying to see how a country can deplete another one of its resources, build an immense fortune and completely erase it from their version of history. French people, we interrupt your regularly scheduled cheese and wine break to bring you these messages. Just so y’all know, the French were real busy trying to colonize and expand their empire. They actually had 2 periods of colonialism (spanning centuries). At some point, the French “owned” almost 1/10th of the planet’s total land area, which is why French is largely spoken throughout the world. It’s not a coincidence that it’s one of the UN languages. Also (and this is because I’m from Haiti, but I’m sure someone from any other French colony would love to give you a piece of their mind as well), don’t you dare NOT teach your children about Haiti again. At some point, Haiti was one of the most lucrative colonies of France. And get this folks. 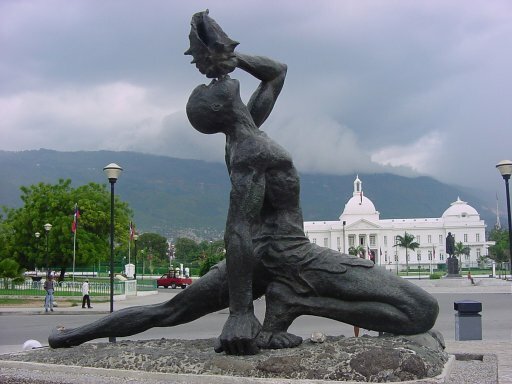 After the Haitians won their independence from France in 1804, they weren’t recognized as a sovereign, independent nation. Do you know what they had to do to enter the political scene/global market? Any guesses? No? They had to pay France back the lost profits from the Haitian revolution! That’s right ladies and gentlemen. Haiti paid France in solid gold to have France recognize us as a sovereign state, AFTER, we kicked them out and fought for our independence. I’m sure they don’t teach you that in A.P European History (I know because I took it in high school). So excuse me if I’m not sympathetic or think it’s a silly mistake when a French person asks me where Haiti is on the world map. Because to be honest, half of those monuments y’all like to show off to the world, were built on the back of my people. FYI: That’s one of our monuments. As in, one that’s in Haiti! Because we all know that countries steal borrow monuments and then expose them in their museums. P.S: The following are only very brief statements to help you gain some general knowledge. While they may be a cool party trick to impress your “history challenged” friends, please read a book (or 5). Also, while this post contains overarching generalizations, the author recognizes that the people she met may not represent the entire French population (although she thinks it represents a pretty large portion). P.P.S: My cousin is a historian. And a really smart one at that. Do not come for me or I will unleash his verbose (I mean that in the most loving way boo) self on you! P.P.P.S: As a scientist, I know the importance of citations/references. But I can’t do the work for you. Plus, who gon’ check me?!? Quite deligtful to read this! Love it! I’m just a lil ole white girl from the south, and I cannot tell you how many people have made rude comments to/about me in French because “Americans only speak English.” Btw, love Stromae, too. Thanks Agnes! Isn’t he so great?